I believe that no one can truly claim to be a master of scale. The most successful scalers are actually just infinite learners. Scaling a team is difficult and company growth often gets stuck when knowledge are not flowing efficiently among team members — the same question being asked multiple times, the same mistake repeats because previous learnings are not shared. We had the same problem in our previous company. We tried to set up a knowledge base but teammates were reluctant to document team knowledge because it required too much time. We then asked ourselves — actually most of the knowledge that we want to document are already communicated somewhere, e.g. through shared articles, videos, chat conservations, etc. Why there isn’t a tool that can convert them into saved knowledge easily? So we started Kipwise, a tool that can help you turn daily communications in Slack into saved team knowledge easily. e.g. shared an article in Slack? Kipwise will turn it into a collaborative version so your teams can collaborate on highlights and notes. With these annotations, your teammates can digest the content in a much more efficient way. Want a specific teammate to pay attention to a certain point in the article? You can mention your teammates in notes. 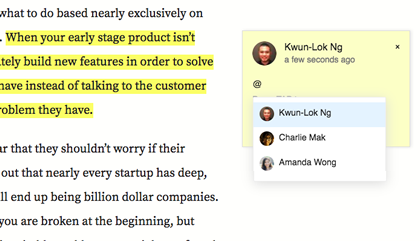 The annotations will get synced to Slack so your teammates will get notified. All shared articles will be saved automatically and you can search for them directly in Slack using the command /kipwise search [keyword]. Our next step is to support more knowledge formats, such as clipping Slack conversations and video annotations to further help teams enhance their knowledge sharing flow. Have any suggestions on what knowledge format Kipwise should support next? Email us at knowledgeispower@kipwse.com. Note: The first three letters in our name Kipwise stand for Knowledge Is Power.